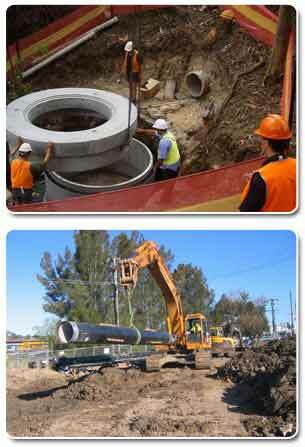 Firedam Civil is an Australian civil construction company specialising in water and sewer infrastructure. The company provides professional engineering and construction services to residential, industrial, and local government. Projects include underground installation of sewerage, water, gas, and storm water reticulation. The management of Firedam Civil has over 20 years experience in this field. Firedam Civil's strategy is to deliver a quality end product, on time, to cost, and to the satisfaction of all the stakeholders. Firedam Civil will strive to produce the highest quality work ethic. The management of Firedam Civil recognise the need to provide, promote, and maintain a safe and healthy working environment in conjunction with the requirements and concerns of the client. Firedam Civil continues to update and refine its application of occupational health and safety issues, environmental procedures, quality assurance and the needs and requirements of all workers and sub-contractors. The core of the company's vision statement is in accordance with the standards, AS/NZS ISO 9001:2000 - Quality Management Systems, AS 4801: 2000 - Occupational Health and Safety Systems, NSW Occupation Health & Safety Act 2000 and AS/NZS ISO 14001: 1996- Environmental Management Systems.